A variety of adventures in one convenient tour, this full-day outing begins with a coach ride to the Grand Canyon with a pit stop at the Hoover Dam. 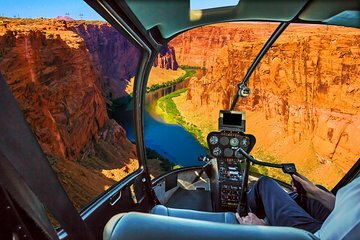 Once there, take a helicopter ride to the bottom of the canyon, where you’ll take a pontoon boat ride on the Colorado River. Helicopter back to the rim, then explore Eagle Point and Guano Point, and take a stroll on the skywalk. On-site lunch is included. For our air tours, there is a maximum 220 lbs weight per person.